You may have seen Kokoborrego cheeses popping up in markets and restaurants around Columbus. They first caught my attention early this spring when I heard (via twitter) that they were the first commercial sheep’s milk cheese producer in Ohio. Kokoborrego make sheep’s milk cheeses from their own flock of East Friesan crossbreeds and, because the sheep’s milk supply is limited, they also make cow’s milk cheeses using milk from a neighboring farm. 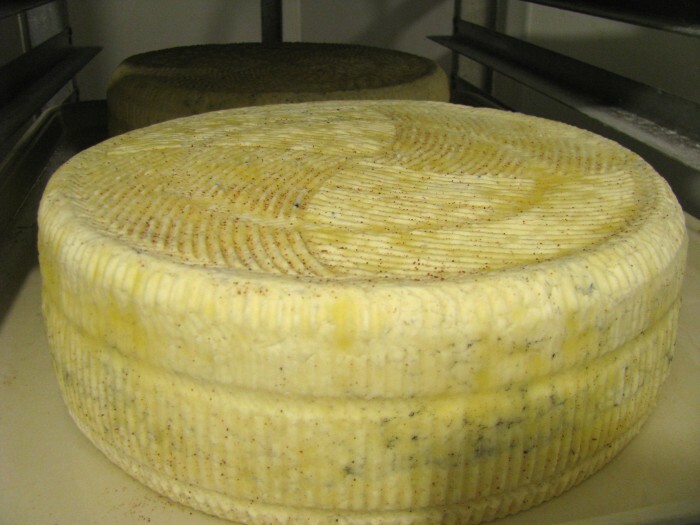 All of the cheeses are raw milk cheeses which mean that they have to be matured for at least 60 days before sale. Their name Kokoborrego comes from the nearby Kokosing River and ‘borrego’ – the Spanish word for sheep. Kokoborrego it’s a joint venture between Ben and Lisa Sippel and Lisa’s brother Ben Baldwin. Ben and Lisa also run Sippel Family Farm, have a large CSA, and sell at several farmers markets as well as to restaurants such as Northstar Cafe. Ben Baldwin’s background is in the restaurant industry. Lisa and her brother Ben went to Vermont to learn how to make cheese and practiced at home for 2 years before starting to produce cheese commercially. Kokoborrego officially started business in February 2011 and since then they have already built up a good network of retail and restaurant customers. 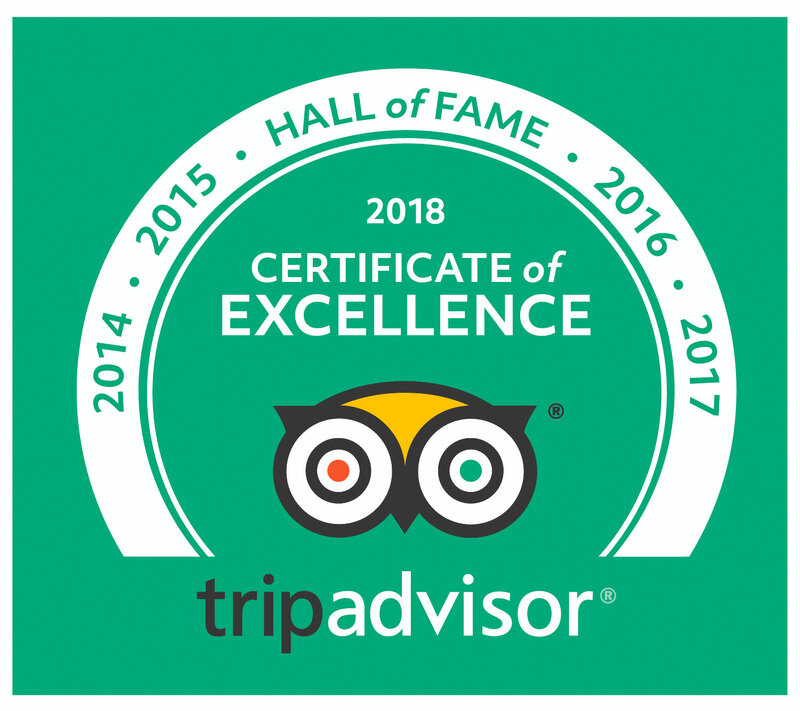 You can find their cheeses at: Weilands Market, The Hills Market, Curds and Whey (at the North Market), Clintonville Co-op and further afield at Jungle Jim’s, Heinens and Zingermans. Restaurants who have purchased their cheeses include: Alana’s, Black Creek Bistro, Heirloom Cafe (in the Wexner Center), The Granville Inn, The Worthington Inn, Deepwood, The Refectory and The Winds in Yellow Springs. Chef David Maclennan from Latitude 41 won the 2011 Local Foods Week grilled cheese throwdown with a sandwich using their Headwaters Tomme. Their business has been successful enough that they are planning to double the size of their flock next year, which will allow them to increase their sheep’s milk cheese production and add a couple more varieties – perhaps a sheep’s milk feta and a manchego style cheese. Sheep’s milk supply is seasonal and at the peak of lactation sheep produce about a gallon of milk a day. Last year the Sippel’s milked 35 sheep but in 2012 that number should be up to 65. Owl Creek (Sheep’s milk) Owl Creek is an old name for the Kokosing River, and this cheese is aged 3-4 months. It has a slightly flaky texture and a nutty slightly sweet flavor. Headwaters Tomme (Cow’s milk) is a farmstead style cheese with a distinctive layer of ash running through the center, similar to Cypress Grove’s Humboldt Fog. The ash helps to regulate the acidity of the cheese. This cheese is also aged 3-4 months and is buttery with slight acidic notes. Headwaters Tomme has been their best seller to restaurants. Moraine (Cow’s milk) This is an alpine style cheese, also aged 3-4 months. It has a creamy smooth texture and is milder than a lot of Swiss cheeses. Whetstone (Cow’s milk) This is a Pyrenean style cheese that may be reminiscent of a cheddar in texture. It is a great choice for melting and has sweet and salty notes. Ben and Lisa are always experimenting with new cheeses and have tried out brie, asiago (aged for 6 months) and parmesan (aged for a year). It’s worth checking out their farmer’s market stall to see if they have anything new. During our visit we had the opportunity to tour the farm, production kitchen and cheese cave. Ben was making a batch of the Headwaters Tomme. 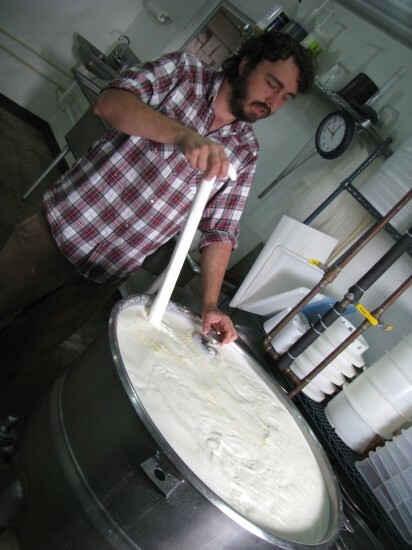 Each 60 gallon batch of cow’s milk produces 42lbs cows cheese which is 5 wheels. 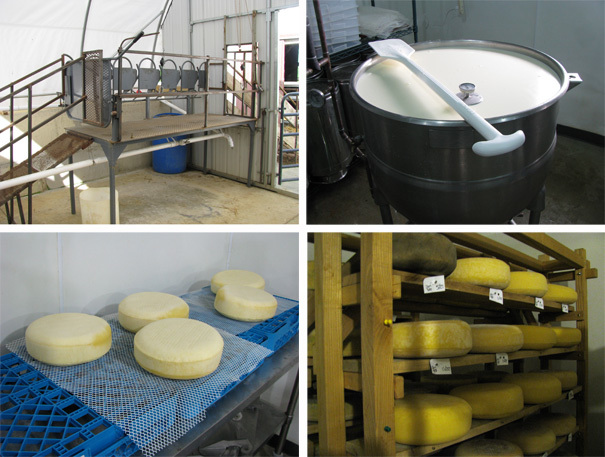 The pictures above show some of the process from milking parlor to aged cheese. There’s certainly no instant gratification in making aged cheeses! We’ve got a growing number of great artisan cheese producers in Ohio. Here are some of our other favorites to look out for at stores and markets: Lucky Penny Creamery (chevre and feta), Blue Jacket Dairy (love their lemon quark and Gretna Grillin’ cheese), Mackenzie Creamery (a wide variety of flavored chevres), Lake Erie Creamery (try the Blomma), Laurel Valley Creamery (a staple on the menu at Knead) and Canal Junction (try the Flat Rock or Lock 21). Great images & post. Love this story! I discovered Kokoborrego cheese yesterday @ shaker sq farmer’s market. I sampled 3 available & absolutely loved all of them. I selected the Moraine for a for ‘ local’ meal I was preparing for our best friends who are foodies especially local products. I served your cheese as an appetizer. We were all delighted @ the wonderful richness! I prepared a side of ‘recommended’ caramelized onions,(WOW!) served w/ homemade organic seeded whole grain flat breads, & kalmata olives. So delish, this could be a meal in itself! I especially look forward to my next purchase & especially trying your sheep milk cheeses next season as this seems to be my favorite lately. Thank you for creating truly wonderful artisinal products! We in Cleveland area are very fortunate! We’re glad you liked it, and we’re happy that Cleveland has been so good to us!